Opportunity for Members to display their car if they are selling to a large captive crowd of club members and guests. Allows members to bring their Race Car on the day for display only to show off their competition cars to enhance the event. Allows members and Porsche Cars to proudly participate / show at the event without the pressure of Judging. General Category for Wash and Polish which will be broken down into sub categories after registration closes. General category for Was & Polish which is designed for modified cars. Sub categories will be determined after registrations close. Join a once in a life time 70 Year Anniversary Celebration of Porsche in conjunction with PCNSW annual Concours d'Elegance. 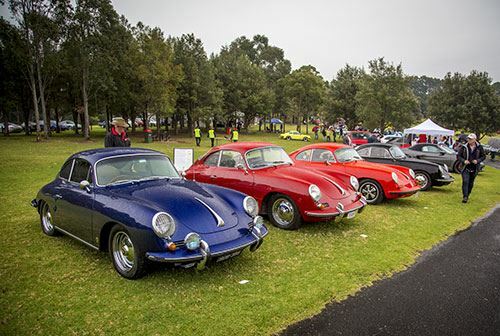 The PCNSW Concours has long been the annual Club showpiece providing a perfect platform for not only the very special and increasingly rare cars to be displayed but also the one event in the club calendar that brings all members together to admire and share each other’s Porsche proudly on display. We have designed the event to offer all options. The hard-core Open Concours category accommodating the serious competitor, Wash and Polish is an excellent introduction category for members who wish to have their car judged without the need to spend too much time in preparation. All judging categories results will be open and transparent, thus ensuring members know where points are lost to assist them to prepare for future events. Additionally, we have enhanced the event with a number of non-judged categories. Cars for Sale for those that wish to sell their car, Race Car Display to allow the competition-biased members to show their car proudly and Park Up Display, allowing members and non-members to park their car in a safe location that is in effect also is on display without being judged. Throughout the day there will be a roving commentator interviewing participants about their association with the club and asking questions relating to their car and its history. This year’s event will be held in conjunction with Porsche Cars Australia, in recognition of celebrating 70 years of Porsche sports cars. All Porsche owners are invited to ‘Park Up’ their Porsche in celebration of this milestone. All vehicles displayed on the day will be presented with a limit edition grille badge acknowledging the 70-year Anniversary Celebration. The event will feature trade displays promoting Porsche related car care and restoration products to help members care for or enhance their Porsche investments. Club merchandise will be available to purchase, presenting the perfect opportunity to buy the clubs apparel. A Hospitality Marquee is provided for you to relax and enjoy refreshments on sale. Don Lucas Reserve Cronulla offers a lush parkland setting with a gorgeous backdrop of one of Sydney's iconic beaches to show off your car. Enjoy the day of camaraderie, picnicking, and a gentle stroll throughout the park or beach. At the conclusion of judging, category class winners will be presented with certificates and the perpetual trophy awarded. Sub Categories will be determined after registrations close.